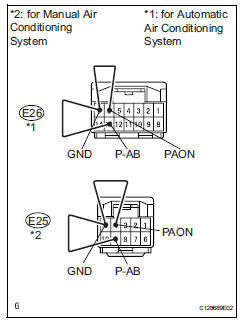 The passenger airbag on / off indicator circuit consists of the center airbag sensor and the heater control panel*1 or *2. 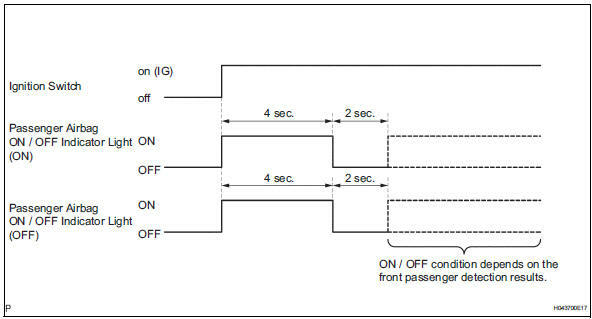 This circuit indicates the operation condition of the front passenger airbag, the front passenger side airbag and passenger side seat belt pretensioner. Dtc b1660/43 is set when a malfunction is detected in the passenger airbag on / off indicator circuit. 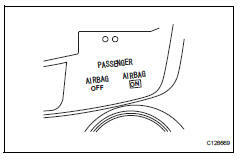 Check the passenger airbag on / off indicator operation. Check that the connectors are properly connected to the center airbag sensor and the front passenger seat belt warning light. Ok: neither on nor off passenger airbag on / off indicator comes on. Disconnect the connector from the front passenger airbag on / off indicator light. Using a service wire, connect e45-23 (paon) and e45- 17 (p-ab) of connector b. Disconnect the service wire from connector b. Check that the connectors are properly connected to the center airbag sensor and the heater control panel*1 or clock*2. Disconnect the connector from the heater control panel*1 or clock sub-assembly*2. Using a service wire, connect e23-6*1 e22-4*2 (paon) and e23-7*1 e22-5*2 (gnd) of the heater control panel *1 or clock*2. 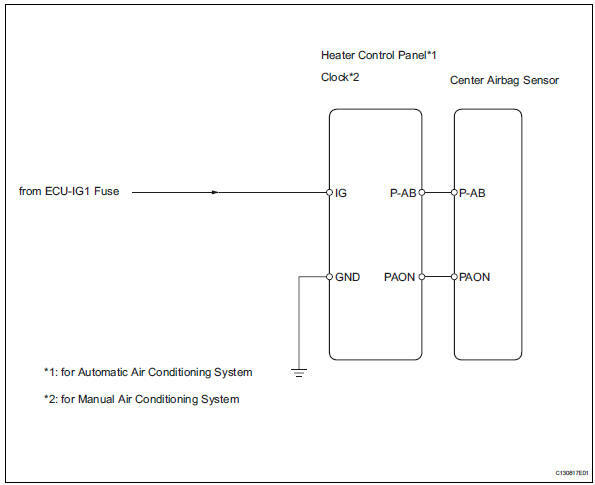 Using a service wire, connect e23-13*1 e22-9*2 (p-ab) and e23-7 *1 e22-5*2 (gnd) of the heater control panel *1 or clock*2. Connect the connector to the center airbag sensor. Connect the connector to the heater control panel*1 or clock*2. Ok: dtc b1660/43 is not output. Dtcs other than b1660/43 may be output at this time, but they are not related to this check.